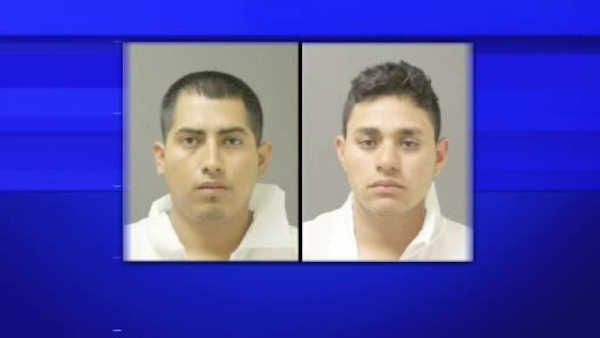 HAMPTON BAYS, Long Island (WABC) -- Police arrested four young men, two of whom are teenagers, in connection with a double stabbing outside a bar on Long Island. It happened early Saturday morning in the parking lot of Charlie Brown's bar in Hampton Bays. First responders took two men to the hospital. One, a 30-year-old Riverhead resident, was stabbed in the torso and is in grave condition. The other man, 23, is serious but stable. Detectives charged the four suspects with gang assault after locating them a few miles from the scene. The suspects are Carlos Gutierrez-Zacupa, 23, of Flanders, Nelvin Ramos-Andrades, 18, of Hampton Bays, Luis Linares-Chavez, 22, of Westhampton, and Marvin Siciliano-Nunez, 19, of Hampton Bays. Luis Linares-Chavez was additionally charged with a Driving While Ability Impaired (DWAI) .